In 1961, Burch (1) published the development of a new technique for colposuspension, based on a technique started in 1958. A paramedian incision was used to enter the abdomen and space of Retzius. He instilled 50 cc of milk in the bladder to identify possible perforations. The periurethral tissue was cleaned off and then three 2.0 chromic sutures were placed at the midurethra and the bladder neck. These sutures were fixed to Cooper's ligament. In 1968, Burch (2) reported a subjective cure rate of 92% in 143 patients with 10 to 60 months of follow-up. Tanagho (3) suggested several refinements to increase the cure rate for Burch col-posuspension (Table 1). Tanagho stressed that the importance of the surgical repair "is to preserve the initially intact sphincteric mechanism, to restore its proper position, and to provide it with adequate support." 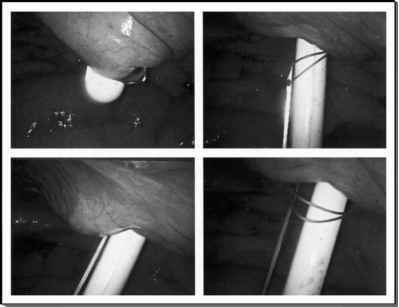 This was achieved by clearing off the overlying fat, while staying at least 2 cm lateral to the urethra and urethrovesical junction. Elevation of the anterior vaginal wall by the surgeon's hand enabled the dissection and correct placement of absorbable sutures at the midurethra and lateral to the urethrovesical junction. He stressed the formation of a "hammock" of support without compressing the urethra against the pubic bone, while elevating the vaginal wall to approximately 2 cm below Cooper's ligament. Many physicians consider the Burch-Tanagho colposuspension the "gold standard" for the treatment of primary genuine stress incontinence. We feel the laparoscopic colposuspension must include the Burch-Tanagho technique in order to be called a laparoscopic Burch colposuspension, and any variation on this technique in this chapter will be simply called a laparoscopic colposuspension.